The image of a citrus tree with brightly colored fruits nestled amid its dark green leaves calls to mind sunshine and balmy subtropical breezes. Both orange and lemon trees grow in the subtropical regions of North America. Although similar in appearance and growing conditions, orange and lemon trees have several key distinguishing traits. No one who has tasted an orange and a lemon can confuse them. Oranges taste sweet and are often consumed as fresh fruit, according to the United Nations Conference on Trade and Development. Lemons, on the other hand, have a strong, sour taste best consumed in small quantities along with other foods. Both types of citrus also have important uses for processing. The fruits differ in coloration, and their bold colors give rise to descriptors such as the adjective "orange" or "lemon yellow." Both the orange and lemon trees originated in northern India. Lemons were the first to achieve a wider distribution, going first to Italy by 200 CE and spreading throughout southern Europe, China and the Middle East by the time Columbus carried the first lemons to the New World at the end of the 15th century. Oranges journeyed to Italy in 1450 and were carried by French and Spanish explorers to the New World. Lemon trees remain relatively small, reaching 10 to 20 feet in height, according to the Purdue University horticulture department. Orange trees may reach heights of up to 50 feet in comparison. Although both trees produce elliptic or ovate-shaped leaves, orange leaves grow in a compound arrangement, with multiple leaves arising from a single bud. Lemon leaves have jagged edges, and the branches of the trees bear thorns. Oranges may or may not have toothed leaves. Although both trees produce white flowers, they have very little else in common. Orange trees bear clusters of fragrant flowers, each with five oblong petals settled inside of a saucer-shaped calyx, a modified leaf that cups the flower. Orange tree flowers contain 20 to 25 yellow-topped stamens. Lemon tree flowers grow singly or in clusters and have only a mild fragrance. The petals are long, and each flower has four or five. Underneath, the petals are purple in color. Inside the flower, you will find 20 to 40 yellow stamens fused into one or several parts. 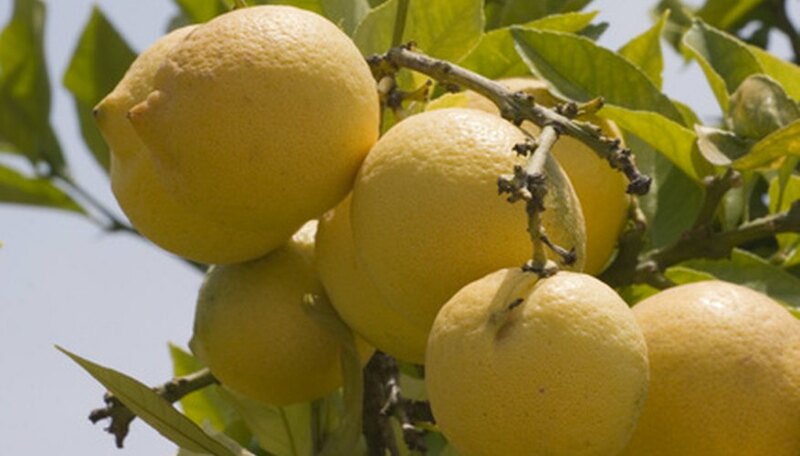 Orange trees tolerate colder growing conditions, while lemons have the lowest cold tolerance of any citrus fruit, according to the Texas A&M University Extension. Both types of trees prefer loamy, well-drained soil in a full-sun location. Unlike lemons, which can hang on the tree for months before use, over-mature oranges will soften and drop from the tree. Both trees are susceptible to the same pests and diseases, but these rarely prove life-threatening.